Because I didn't liked USB 3.0 ethernet chipsets and USB-based ethernet cannot bear some network-intensive tasks, I wanted to use PCIe-based Thunderbolt ethernet controller on my XPS 15 9550. As there is no Thunderbolt 3 "PCIe" ethernet adapter (except docks), I chose to buy Apple Thunderbolt 3 to 2 adapter and Thunderbolt 2-based ethernet adapter. I plugged it into the XPS 15 9550 (tested with BIOS 1.1.19, 1.2.14, 1.2.16 and latest Thunderbolt firmware with NVM version 16), and the PCIe device did not pop up. Instead, only USB billboard device is appearing saying that "Alternate Mode configuration not attempted". Both Windows 10 and Ubuntu 16.10 failed to detect the device. I moved this configuration to MSI GS63 laptop, and it detected ethernet controller successfully (that laptop utilizing NVM firmware version 18). It seems that other vendors are affected with lower NVM firmware version involving setup with Thunderbolt adapter: see the case of Lenovo too. Do you have planned Thunderbolt NVM firmware update for XPS 15 9550? Looks like XPS 13 9360 is using newer Thunderbolt NVM firmware version, though. I have not heard about any Thunderbolt NVM Firmware update as of right now. Is there any word on whether this will be updated in the near future? Dell is falling behind the curve with regard to keeping their Thunderbolt firmware up to date. Compatibility with devices is a high factor for customets when they decide what device to purchase. So right now, my thunderbolt 3 port is basically useless as Dell cant be bothered to update its firmware? And has no plans to update it either? Great support for your existing customers! 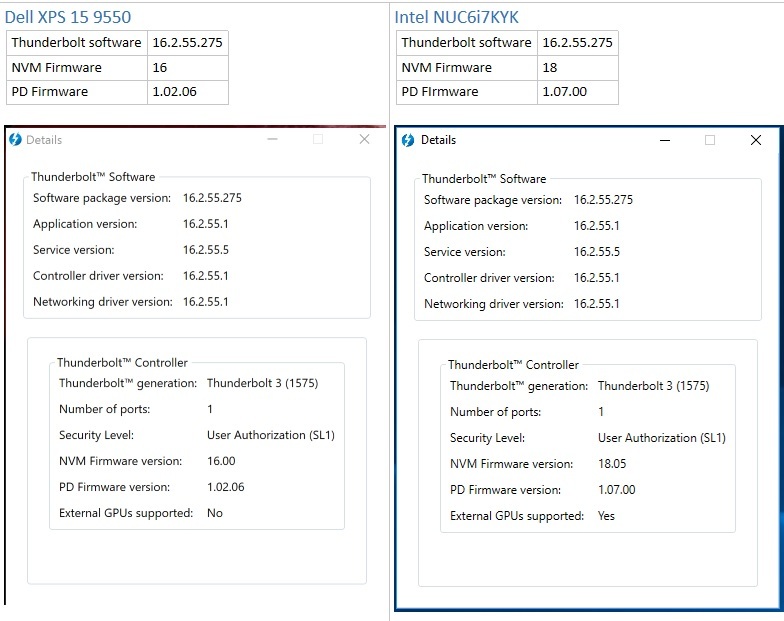 Per the Thunderbolt software “settings” page of the respective systems (screen capture below), both the Dell XPS 15 9550 and the Intel NUC6i7KYK are using the same Thunderbolt Controller generation, “Thunderbolt 3 (1575)”, hardware. However, compared to Intel, the firmware support that Dell is offering is behind in both the NVM firmware version (NVM 16.00 vs NVM 18.05) and the PD firmware version (PD 1.02.06 vs PD 1.07.00). As you can also see in the below driver settings screen capture, because Dell has not updated their Thunderbolt 3 firmware, some functionality (such as “External GPUs Supported”) doesn’t exist on the XPS 15 9550, while it does on the NUC6i7KYK. Since I have both systems, I can also tell you that the above mentioned Apple TB3-TB2 adapter works fine on my Intel NUC6i7KYK, but just gives a USB error when plugged into my Dell XPS 15 9550.
https://downloadcenter.intel.com/download/26141/Thunderbolt-3-Firmware-Update-Tool -- the NVM 18 firmware was released by Intel for the NUC6i7KYK way back at 7/15/2016. When is Dell going to release this long overdue firmware update? Any update? It's unacceptable that Dell doesn't provide update on a slightly over 1 year old model, especially as current NVM prevent usage with TBM-15 and Dell 5K display even if it was written specs. And XPS are supposed to have premium support... XPS 9560 using same controller got a far more recent NVM. Dell your reputation (and renewal sales) are at stake here. The compatibility issue with the Apple device is NOT NVM version related but related to the TI PD chip selection. BME was blocked by Apple because the TI PD chip we are using was NOT accepted by Apple for unknown reasons. However, I have not seen any discussion about an non-Apple TB3 *computer* not working with an Apple TB3 *peripheral* (like the Dell XPS 15 9550 not working with the Apple TB3-TB2 adapter.) Since Dell doesn't appear to have published any official technical statement on this issue, I'm not sure if the above excuse is just an incorrect answer from support/Dell engineering. At any rate, even the TI USB-C chipset generation issue breaks the Apple TB3-TB2 adapter compatibility, that problem also doesn't explain why the Intel NUC6i7KYK has eGPU support "Yes", while the XPS 15 9550 has "No". I wish I could see release notes for Thunderbolt 3 NVM 18 and NVM 21 to see what Dell users really aren't getting because of Dell not updating the TB3 firmware on the XPS 15 9550. I got XPS 9550, HP ZBook G3 and HP ZBook Studio G3. I also have TB15, StarTech TB3 to TB adapter and Universal Audio Satellite TB device. My XPS has NVM16 (1575), ZBook G3 NVM18 (1577) and ZBook Studio G3 NVM16 (1577). I was not even able to install firmware to detect TB port at all on my XPS, just the other day when Windows 10 Editors update came out, my port actually showed up in Device Manager. Yet still, none of my TB accessories/devices is being detected by my XPS at all, while both of my HP laptops detect everything PNP. I've tried resetting my XPS 2 times and did everything from scratch twice, nothing. Also, my HP's are running Windows 7, not sure if that matters anyhow. Pretty frustrating.. got over $1K worth of TB devices that I cannot use. I've also got an XPS 15 9550 and I can't get it to recognize the TB16, I plug it in and nothing happens. I'm convinced that the current Thunderbolt firmware support at NVM 16.0 is to blame. I've posted detailed descriptions of this problem on this forum and I haven't got any response from Dell. This is very frustrating that Dell won't support this product!